Elsa Beniada, Peter Behrbohm, Klara Bindl, Victoria Hlubek, Tobias Hönig, Cornelia Müller, Markus Rampl, Paul Reinhardt, Jacob Steinfelder, Caspar Viereckl; Structural engineering: Karin Guttmann, Robert Hartfiel, Andreas Schulz / Pichler engineers. Complying with safety instructions just isn’t his thing. Covering up hot water pipes with insulation because of regulations? When, practically speaking, their heat could be used to warm a room? That’s not an option for Arno Brandlhuber. This is an architect who mostly works by two mantras: use cost-effective building methods and implement a reasonable energy economy. Why? Not because he’s a born energy saver – as a teenager, he always preferred to leave the lights on. It’s simply because it makes sense, he says. It’s just that the man who established one of the most important creative centers in Berlin – a polycarbonate building at Berlin’s Brunnenstrasse 9 – likes brightly lit living spaces a little too much. Naturally, his Antivilla is opulently lit as well – in this case by former church lights. But the lights are just one feature of the former lingerie factory (Ernst Lück) building in Krampnitz, near Potsdam, that’s currently causing a stir. It’s also the Antivilla’s sustainable energy concept, and its most visually striking feature, the giant windows Arno and his friends carved out with a sledgehammer to provide better views of the lake. For him, the view is one of the most important facets of the Antivilla, alongside the architect’s cost-effective building methods. 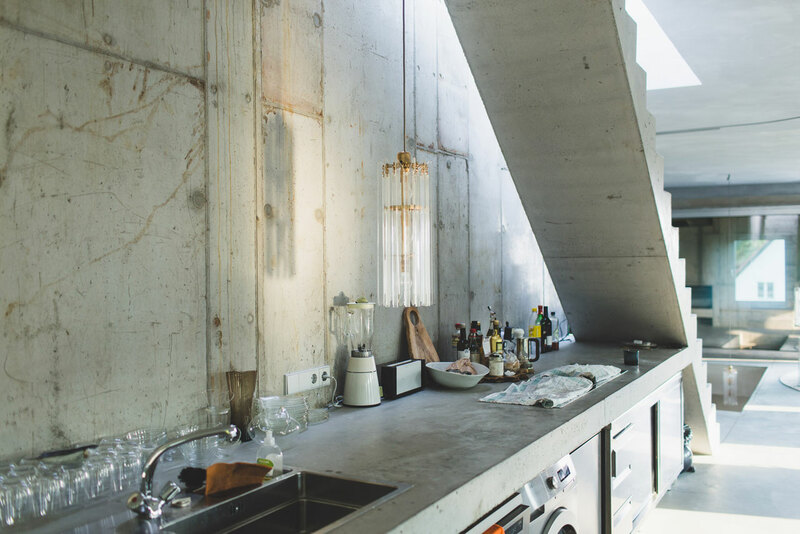 We meet Arno at his apartment above the office at Brunnenstrasse. He lights a cigarette on the gas stove in the kitchenette and immediately you notice that everything up here is open. In fact, the only door leads to the bathroom. There isn’t much here that is private: a bookcase, a few DVDs, a chess board. Yet the apartment definitely feels inhabited. 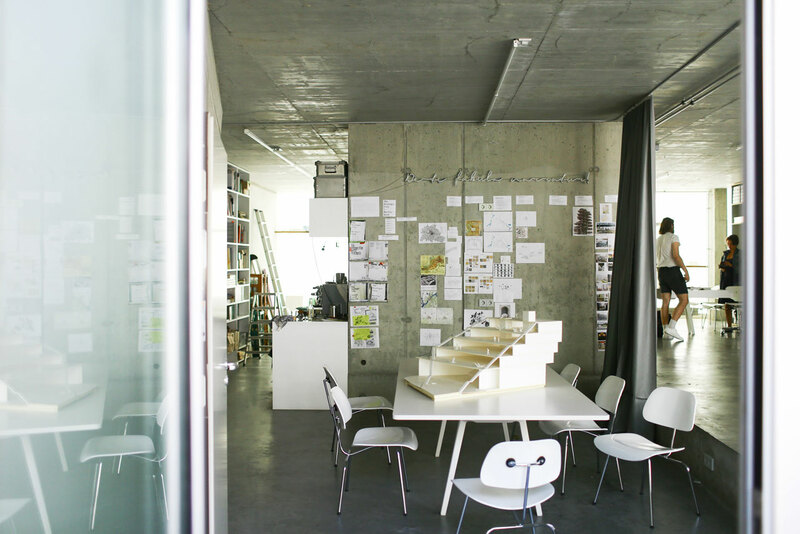 And even though the space is Arno’s workplace, and even though it’s full of art, it’s not a showroom. "It is what it is," says the architect, as he smokes and wipes his hair away from his forehead. And that means it can change according to any mood or need. You have been living at Brunnenstrasse 9 for six years now. 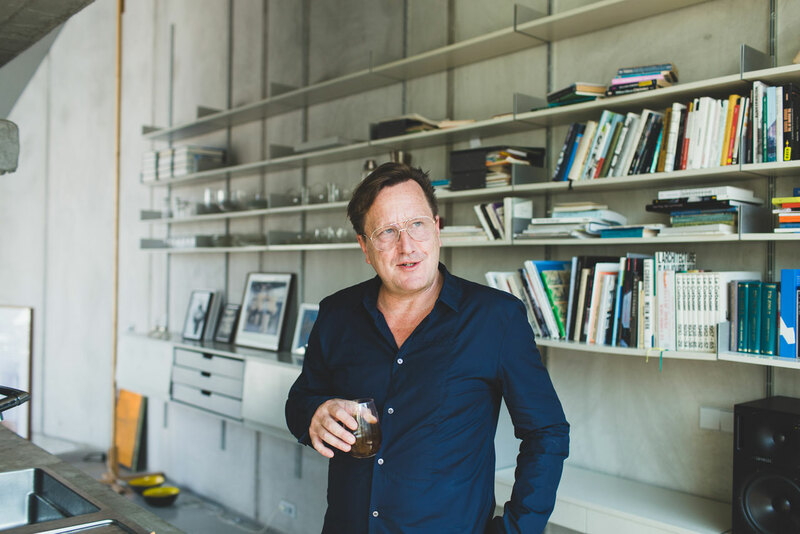 Has the feel of your apartment changed since the last interview for Freunde von Freunden? In a certain way, yes. Earlier I didn’t have an idea of how the space would live, and how I would live in the space. You grow into it. Your own habits change. And that’s a good thing. Do you have a concrete example of habits that are different? In the beginning I lived on more floor space here. Below this apartment I had about another third of a floor for clothes and stuff that accumulates. But I noticed: It all has to go! Now I only have a few clothes up here, hung up in the front. Otherwise, I got rid of anything that didn’t have a place here. Living with less works well here. Do you need this space, this expansiveness that both your apartment and your Antivilla have? I don’t need more than one room. I’m either in bed or in the bathroom, in the kitchen. I’m either reading or working. Since I can only be in one place at a time, it’s enough if this one place provides for all functions equally. For this reason there are no walls here, only around the bathroom. I think that we are much too stuck in the belief that our living spaces have to resemble those of our parents – even if we thought we had detached from them after a few tough processes. Maybe it’s time to comment on the general fear in Germany, the strange discomfort when it comes to concrete. It probably comes from the residential developments of the late 50’s and particularly the 60’s. Something got stuck there. And the social rigor associated with these large housing developments is often associated with concrete as a building material as well. But by now this has largely dissipated. I don’t think there is anyone left that sees concrete any differently from wood or plastic or glass. But since we are so little inclined to look toward the future and are obsessed with the past instead, we are still talking about concrete as a bad component. Do you see Berlin as obsessed with the past? When we drive through the city and look at what is being built these days – Yes. Sure, we’re building city castles; we’ve rebuilt all of Friedrichstrasse. In other words: With respect to the built environment here, there is clearly a concept that reaches far back – even though on the other hand all the young creatives find themselves here. Definitely not representative! If I were allowed to build, I would build at least 1,000 apartments with social cohesion. As inexpensive as possible – and in such a way that they can fulfill other requirements. Not always with the conditioned idea of the nuclear family in mind. 50 percent of the families here in Berlin no longer operate based on classical structures. Many are single parents and have to work, often from home. So, of course, they have to think about combining living and working. But apartments don’t allow for that at all. If you have to walk through a long hallway on the third floor, passing your neighbors’ shoes – it’s impossible to head a small company that way! Therefore we need totally different, new building typologies. In Antivilla you combine both working and living. How much time do you spend out in Krampnitz? I’m on the road a lot, probably half of the year. And for this reason I am always really glad to be here at Brunnenstrasse. Krampnitz is an experiment. And I have to say: Spending the summer with lake access is excellent. At both locations, multiple use is possible and desirable. Antivilla is my studio. 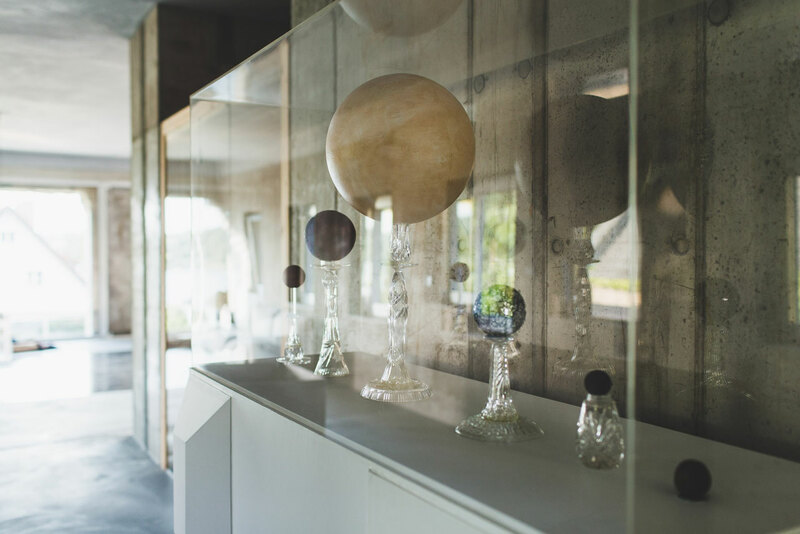 Events and symposiums are held there – and overnight stays happen in the studio as well. No. What would I want there? It’s wonderful to start the day with swimming. It’s so energizing. Other rituals such as a double espresso or a cold shower are nothing in comparison. I go swimming in the morning, work for two hours, and in those two hours I accomplish half a day’s work. Even so, I think that the city or cities are the best and greatest way of life – because they can integrate such diverse ways of life. In this respect, I believe that everything should be focused on cities – or on the areas surrounding cities. And in those areas you will find a lot of constructions. Similarly to the house at Brunnenstrasse: There was a plot that was offered that already contained something – in this case, an old textile factory. The plot was offered for a 350 square feet single family home. But it already contained a 1,600 square feet building. Imagine this: You pay the land price for a single family home, plus the demolition costs, instead of just using the existing property. That way you have twice the gains. No demolition costs, and a building shell. And instead of an allowance of 350 square feet, you have 1,600 square feet to reuse. You can even spend less on insulation, which leads to a better overall energy result by keeping preexisting structures in use. In this respect this is a model to be widely applied. Speaking of energy result: Antivilla has a peculiar heating concept, doesn’t it? Yes. When it’s getting colder outside, we’re generating heat in the heart of the Villa. We pull up a thin curtain around this middle section of the space and essentially make sure that warm and cold air can’t exchange as easily. So in there it’s getting warm and cozy, and you can still look out at everything. Of course you can also move around outside of the curtain. But you’re living in a more secluded manner. And that’s nothing unusual if you look back in history. Everyone with grandparents or parents from a rural area knows: Winter life is smaller and summer life simply bigger. We have just forgotten that! You are always surrounded by colleagues, artists, creatives. How does the interaction with other creatives inspire you? It’s very simple: If you ask a fruit grower a question, he answers with a fruit. If you ask an architect a question, he answers with a building – and that’s true for many visual artists. When I am spending time with other creatives, they always answer from different perspectives. And only that way I am able to imprint something new into an existing property or environment. If you ask a fruit grower a question, he answers with a fruit. If you ask an architect a question, he answers with a building - and that’s true for many visual artists. When I am spending time with other creative people, they always answer from different perspectives. And only that way I am able to imprint something new into an existing property or environment. It’s two-sided. On the one hand, I have gotten a certain amount of attention. On the other hand, the affordable rent of our house wasn’t able to bring down other rents in the area. For that to happen we would have to keep building. The economics of attention are rather counterproductive sometimes. Either way, I believe that as an architect you have to be able to arrive somewhere. Berlin has received me extremely well. Berlin has a very specific dialogical quality. Fortunately everything is ambiguous here. There is much juxtaposition that makes the city particularly productive – and particularly creative. Your work is attracting a lot of attention, not just in Berlin. Does this mean something to you or do you think: It must be possible to do more? No, attention is always great. The working conditions are what is important to me. I believe that better working conditions yield better results. I’m sure this is true for everyone. And for us as well. I say “us” because we always work as a collective. Each person adds something different. Each collaboration keeps you going. Is it true that the churches from your childhood in Karlstein am Main have inspired your calling? That is absolutely true. I was an altar boy at a Catholic church. It was the first modern church in Germany, built by Dominikus Boehm from local sandstone. 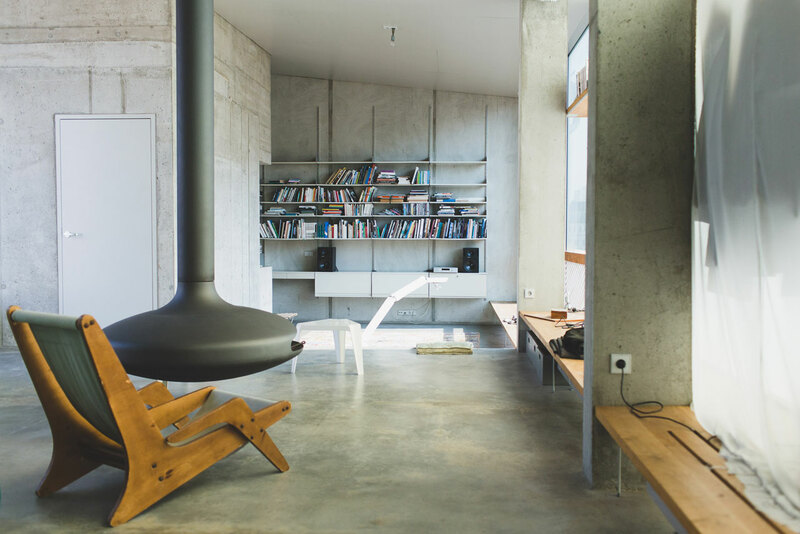 The ceiling was made from coarse wooden planks, twisted against each other – the interior was very simple. I was always looking around and not really consciously aware of the influence. Later I noticed that this church appears in my mind again and again. And I think that’s why I became an architect. Did you make this decision ideationally or did you also want to achieve something, maybe gain a certain fame? I think if you’re just out for fame, you become an entertainer. You can’t become an architect. Architecture is much too tedious. Is architecture also an art form for you? These pieces of art are mainly trade objects from projects with and for artists. And because everything comes from a trade, I must have at some point been interested in a question that an artist directed at me. That is often sufficient even in the long run. Arno, thank you very much for your openness and for this beautiful conversation. - Anna Schunck. This portrait is part of Home Stories – a collaboration that Freunde von Freunden produces with Siemens Home Appliances which is co-published by Yatzer. Home Stories explore the topic of innovative urban living as seen through the lenses of select inhabitants in modern global cities. The portraits present unusual spaces, highlighting their aesthetic and technological qualities, alongside a look into their inhabitants' lives. 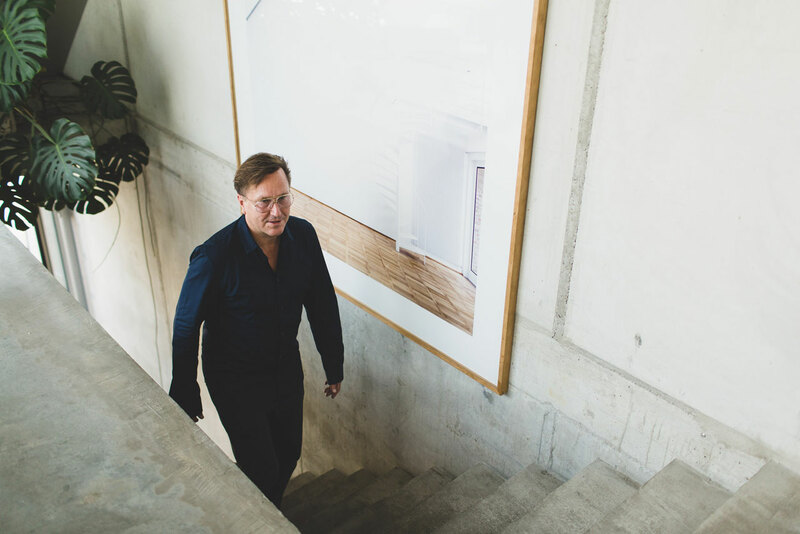 To find out more about about Arno’s work, both at the Antivilla and his home on Brunnenstrasse, see the portrait with him on the Home Stories site. 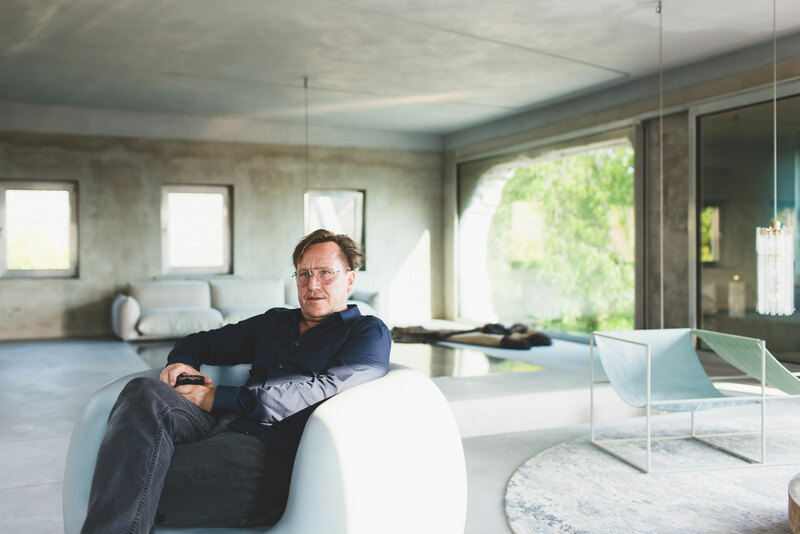 There he discusses his approach to juxtaposing historical and modern elements, as well as the importance of being expansive with ergonomic spaces.